At Nuffield Health, we’re committed to developing high standards of clinical care and governance, and we know that the way to achieve this is through a close partnership with our consultants. What is the medical society? The Medical Societies act as forums to enhance our relationships with the Consultants who work with us. Our overriding aim is to promote clinical excellence and support the highest levels of patient care. 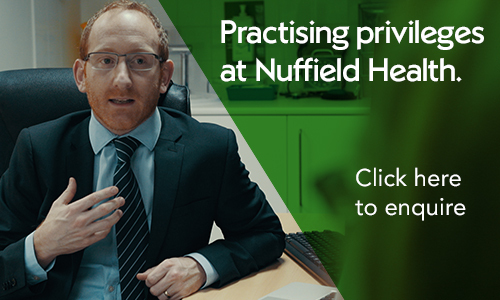 Membership of the Society will be open to every Medical Practitioner holding Practising Privileges at the Hospital, subject to compliance with the Nuffield Health Practising Privileges Policy.